Get an update on The Association of Open Group Enterprise Architects (AOGEA) and learn more about its recent merger with the Association of Enterprise Architects. What's more, receive an assessment of the current maturity levels and overall professionalism drive of EA, and learn more about what to expect from the EA field and these organizing groups over the next few years. To delve into the current state of EA, we've interviewed Steve Nunn, Chief Operating Officer of The Open Group and CEO of The Association of Open Group Enterprise Architects. The discussion is moderated by BriefingsDirect's Dana Gardner, Principal Analyst at Interarbor Solutions. Gardner: Is EA dead or outmoded as a professional category? Nunn: Absolutely not. EA is very much the thing of the moment, but it's also something that’s going to be with us for the foreseeable future too. Both inside The Open Group and the AOGEA, we're s eeing significant growth and interest in the area of EA. In the association, it’s individuals becoming certified and wanting to join a professional body for their own purposes and to help the push to professionalize EA. Within The Open Group it’s entities and organizations. Whether they be commercial, governments, academic, they are regularly joining The Open Group Architecture Forum. So, it's far from dead and in terms of the importance of business overall, EA being relevant to business. A plenary session here at the conference is a good example. It's about using EA for business transformation. It's about using EA to tie IT into the business. There is no point in doing IT for IT's sake. It's there to support the business, and people are finding that one way of doing that is EA. Gardner: Are the major trends around mobile, security, and cyber risk putting wind in your sails? Nunn: Absolutely. We're seeing increasingly that you can't just look at EA in some kind of silo. It's more about how it fits. It's so central to an organization and the way that organizations are built that it has all of the factors that you mentioned. Security is a good one, as well as cloud. They're all impacted by EA. EA has a role to play in all of those. Inside the Open Group, what's happening is a lot of cross-functional working groups between the Architecture Forum, the Security Forum, and the Cloud Work Group, which is just recognition of that fact. But, the central tool of it is EA. Gardner: What's important about certification for enterprise architects? Nunn: Everyone seems to want to be an enterprise architect or an IT architect right now. It's that label to have on your business card. What we're trying to do is separate the true architects from one of these, and certification is a key part of that. If you're an employer and you're looking to take somebody on to help in the EA role, then it’s having some means to assess whether somebody really has any experience of EA, whether they know any frameworks, and what projects they've led that involve EA. All those things are obviously important to know. One of the great things we see is the general acceptance of certification as a means to telling the wood from the trees. There are various certification programs, particularly in The Open Group, that help with that. The TOGAF Certification Program is focused on the TOGAF framework. At the other end of the spectrum is the ITAC Program, which is a skills and experience based program that assesses by peer review an individual’s experience in EA. There are those, there are others out there, and there are more coming. One of the great things we see is the general acceptance of certification as a means to telling the wood from the trees. Gardner: It was three years ago at this very event that The AOGEA was officially launched. Tell us what’s happened since . Nunn: Three years ago, we launched the association with 700 members. We were delighted to have that many at the start. As we sit here today, we have over 18,000 members. Over that period, we added members through more folks becoming certified through not only The Open Group programs, but with other programs. For example, we acknowledged the FIAC Certification Program as a valid path to full membership of the association. We also embraced the Global Enterprise Architecture Organization (GEAO), and those folks, relevant to your earlier question, really have a particular business focus. We've also embraced the Microsoft Certified Architect individuals. Microsoft stopped its own program about a year ago now, and one of the things they encouraged their individuals who were certified to do was to join the association. In fact, Microsoft would help them pay to be members of the association, which was good. So, it reflects the growth and membership reflects the interest in the area of EA and the interest in individuals' wanting to advance their own careers through being part of a profession. Enterprise architects are a highly valuable resource inside an organization, and so we are both promoting that message to the outside world. For our members as individuals what we're focusing on is delivering to them latest thinking in EA moving towards best practices, white papers, and trying to give them, at this stage, a largely virtual community in which to deal with each other. Where we have turned it in to real community is through local chapters. We now have about 20 local chapters around the world. The members have formed those. They meet at varying intervals, but the idea is to get face time with each other and talk about issues that concern enterprise architects and the advancement of profession. It’s all good stuff. It’s growing by the week, by the month, in terms of the number of folks who want to do that. We're very happy with what has gone in three years. Gardner: There are several EA organizations, several communities, that have evolved around them. Now the AOGEA has announced its merger with the Association of Enterprise Architects (AEA). How does that shape up? Nunn: Well, it is certainly a melding of the two. The two organizations actually became one in late fall last year, and obviously we have the usual post-merger integration things to take care of. As we develop, we're getting closer to our goal of being able to really promote the profession of EA in a coherent way. But, I think it’s not just a melding. The whole is greater than the sum of the parts. We have two different communities. We have the AOGEA folks who have come primarily through certification route, and we also have the AEA folks who haven’t been so, so focused on certification, but they bring to the table something very important. They have chapters in different areas than the AOGEA folks by and large. Also, they have a very high respected quarterly publication called The Journal of Enterprise Architecture, along the lines of an academic journal, but with a leaning towards practitioners as well. That’s published on a quarterly basis. The great thing is that that’s now a membership benefit to the merged association membership of over 18,000, rather than the subscribed base before the merger. As we develop, we're getting closer to our goal of being able to really promote the profession of EA in a coherent way. There are other groups beyond that, and there are the early signs of co-operation and working together to try to achieve one voice for the profession going forward. Gardner: This also followed a year ago the GOAO merger with the AOGEA. It seems as if we're getting the definitive global EA organization. Tell me about this new über organization. Nunn: Well, the first part of that is the easy part. We have consulted the membership multiple times now actually, and we are going to name the merged organization, The Association of Enterprise Architects. So that will keep things nice and simple and that will be the name going forward. It does encompass so far GEAO, AOGEA and AEA. It's fair to say that, as a membership organization, it is the leading organization for enterprise architects. There are other organizations in the ecosystem who are, for example, advocacy groups, training organizations, or certification groups, and they all have a role to play in the profession. But, where we're going with AEA in the future is to make that the definitive professional association for enterprise architects. It's a non-profit 501(c)(6) incorporated organization, which is there to act as the professional body for its members. Gardner: Let’s get back to the notion of the enterprise architect as an entity. Where are we on a scale of 1 to 10? Nunn: There's a long way to go, and I think to measure it on a scale of 1 to 10, I'd like to say higher, but it's probably about 2 right now. Just because a lot of things that need to be done to create profession are partly done by one group or another, but not done in a unified way or with anything like one voice for the profession. It's interesting. We did some research on how long we might expect to take to achieve the status of a profession. Certainly, in the US at least, the shortest period of time taken so far was 26 years by librarians, but typically it was closer to 100 years and, in fact, the longest was 170-odd years. So, we're doing pretty well. We're going pretty quickly compared to those organizations. There's a long way to go, but we've made good progress in a short numbers of years, really. We're trying to do it on a global basis, which to my knowledge is the first time that's been done for any profession. If anything, that will obviously make things a little more complicated, but I think there is a lot of will in the EA world to make this happen, a lot of support from all sorts of groups. Press and analysts are keen to see it happen from the talks that we've had and the articles we've read. So, where there is a will there is a way. There's a long way to go, but we've made good progress in a short numbers of years, really. 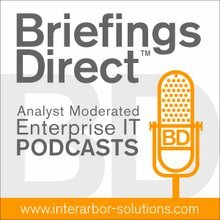 Gardner: What's in these groups for the enterprise? What does a group like the AEA do for them? Nunn: It's down to giving them the confidence that the folks that they are hiring or the folks that they are developing to do EA work within their enterprise are qualified to do that, knowledgeable to do that, or on a path to becoming true professionals in EA. Certainly if you were hiring into your organization an accountant or a lawyer, you'd be looking to hire one that was a member of the relevant professional body with the appropriate certifications. That's really what we're promoting for EA. That’s the role that the association can play. When we achieve success with the association is when folks are hiring enterprise architects, they will only look at folks who are members of the association, because to do anything else would be like hiring an unqualified lawyer or accountant. It's about risk minimization and confidence building in your staff. Gardner: You wear two hats, Chief Operating Officer at The Open Group and CEO of the AEA. How do these two groups relate? Nunn: It's something I get asked periodically. The fact is that the association, whilst a separately incorporated body, was started by The Open Group. With these things, somebody has to start them and The Open Group's membership was all you needed for this to happen. So, very much the association has its roots in The Open Group and today still it works very closely with The Open Group in terms of how it operates and certain infrastructure things for the association are provided by The Open Group. The support is still there, but increasingly the association is becoming a separate body. I mentioned the journal that’s published in the association's name that has its own websites, its own membership. It's one of the leading organizations in the EA space and a group that the association would be foolish not to pay attention to. So, little by little, there will be more separation between the two, but the aims of the two or the interests of the two are both served by EA becoming recognized as profession. It just couldn't have happened without The Open Group, and we intend to pay a lot of attention to what goes on inside The Open Group in EA. It's one of the leading organizations in the EA space and a group that the association would be foolish not to pay attention to, in terms of the direction of certifications and what the members, who are enterprise architects, are saying, experiencing, and what they're needing for the future. It's a very close partnership and along with partnerships with other groups. The association is not looking to take anyone's turf or tread on anyone’s toes, but to partner with the other groups that are in the ecosystem. Because if we work together, we'll get to this profession status a lot quicker, but certainly a key partner will be The Open Group.